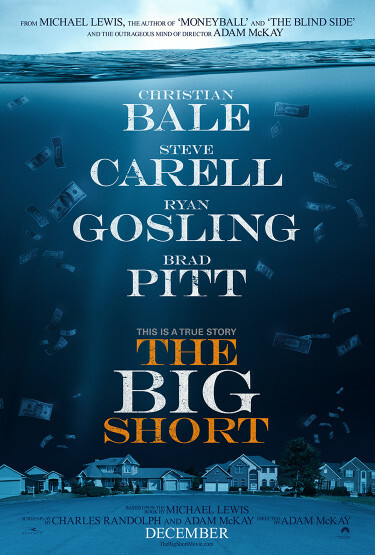 When making “The Big Short,” the story of the Wall Street crash of 2008, it seems director Adam McKay (former head writer of “Saturday Night Live”) must have been considering the short attention spans of Americans. The film is interspersed with photos and video fragments that mimic the relentless, exhausting, clickbait nature of modern media. To make absolutely sure the audience is paying attention (and to add some much-needed humor to the dry subject of finance), McKay employs the following tactics: celebrity chef Anthony Bourdain, stands over a cutting board in a kitchen, and demonstrates the collapse of the economy by using a three-day old fish analogy; actress Margot Robbie soaks luxuriously in a bubble bath drinking champagne, while explaining the market collapse, and Selena Gomez hangs out at a Vegas card table, educating the theater audience about the convoluted nature of C.D.O.’s (collateralized debt obligations). The film serves as a useful primer for those of us (like yours truly) who are not well-versed in the area of finance, or who aren’t entirely clear about what exactly happened to cause the world economy to collapse in 2008. Adapted from the Michael Lewis book of the same title, the film focuses on four different sets of characters, who become aware of the impending market crash of 2008 before anyone else: Mark Baum (Steve Carrell), an obnoxious, angry, loudmouthed hedge fund broker, who yet possesses a strong moral compass; Charlie Geller and Jamie Shipley (John Magaro and Finn Wittrock), two eager young investors attempting to set up their own hedge fund; Jared Venett (portrayed by an unrecognizable Ryan Gosling, with dyed-black hair and a douche-y attitude), a trader who is also the narrator of the film, and socially awkward hedge fund manager Michael Burry (brilliantly portrayed by Christian Bale). Burry is the first to recognize that something is terribly wrong in the housing market. A brilliant and intuitive financier, he predicts that the housing market will entirely collapse in 2007, due to the many sub-prime (highly unstable) loans packaged into mortgage-based securities. He realizes that he will be able to profit from the disaster by betting against the housing market via a credit default swap. Slick, shrewd trader Jared Venett catches wind of Burry’s actions and also decides to bet against the housing market. Through a phone call received in error, Mark Baum hears of Venett’s plans, and decides to partner with him. “I love my job, I love my job, I love my job . . . ” Courtesy Paramount Pictures. Independently of the Venett and Burry, Charlie Geller and Jamie Shipley, while attempting to set up a hedge fund at a bank (and failing miserably), discover a flyer from Venett on a table in the lobby, and are fascinated. As they review the facts and figures, they realize that Venett is right – the housing market will completely collapse, and there will be money to be made from it. Young and inexperienced, they enlist the help of middle-aged Ben Rickert (Brad Pitt), a retired banker. Burned out and disgusted with the world of Wall Street, he’s more interested in organic farming than finance, and is at first reluctant to work with the young men; he finally succumbs, and attends a financial convention in Las Vegas with them in order to gather information. Baum and Venett also attend the convention for the same reason, and it is there that Baum discovers that there is more to the market collapse than just the sub-prime loans defaulting. He is dismayed when he learns exactly how corrupt the world of finance is, and how far people will go to profit off the misfortune of others. Simultaneously, Geller and Shipley, accompanied by Ben Rickert while walking through a casino,do a goofy little dance of joy when they realize how much money they can make. This enrages Ben Rickert, who lectures them that, should they win this bet against the housing market, the entire economy will collapse: people will lose their jobs, and some, their lives. All of the characters (save Venett, who doesn’t seem to be much bothered by it) are experiencing a great moral conflict: they are in a position to make a ridiculous amount of money, yet they’re increasingly aware their great profit will come at the great misfortune of others. Humbled and horrified, Geller and Shipley attempt to warn their family and the press of the impending doom, but no one takes them seriously. Mark Baum, meanwhile, is emotionally unraveling; previously unable to express his emotions over the suicide of his brother, his grief is now coming out in waves, triggered by his increasing disgust and disillusionment. 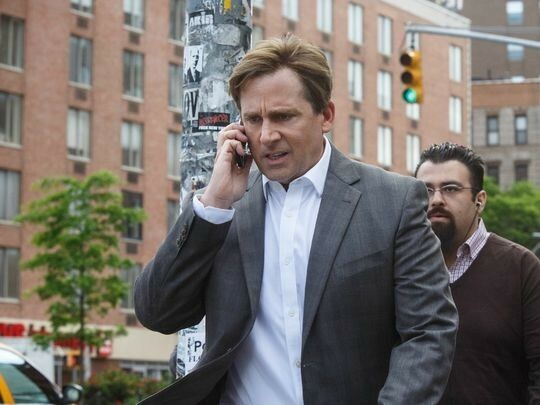 Baum’s tough and angry façade begins to crumble under the pressure, and Steve Carrell’s portrayal is brilliant. Christian Bale is equally so in his portrayal of Burry. Uncomfortable around people, Burry blasts metal music in his office all day, his shield against the outside world. Despite his awkward demeanor, he is fully aware of the level of his genius, and 100% confident in his ability to predict the economic collapse. While meeting with two angry investors, who tell him his strategy is “crazy,” Burry tells them that “anyone can see there is a real estate bubble.” The investor responds that no one can see it, and that’s what makes it a bubble. Burry insists “there’s always markers – mortgage fraud, quintupled since 2000, an average take-home pay. It’s flat, but home prices are soaring. That means the homes are debt, not assets.” Burry, in his own introverted and isolated way, running the numbers alone in his office, ultimately comes to the same realization the other characters do – that the housing market is fraudulent. Adam McKay has described “The Big Short” as a “traumady,” which is accurate; the audience is simultaneously laughing and horrified, appalled (hopefully) by the fact that there has been extremely little accountability for those responsible for the crash. At one point narrator Jared Venett pockets a large check, looks at the camera, and quips, “Hey, I never said I was the hero of the story.” The line elicits both a laugh and a cringe. In real life, there was nothing funny about the crash of the economy that left many jobless, homeless, impoverished or dead. One can hope that Adam McKay succeeded in his goal in helping a celebrity-distracted public understand what really happened, who’s responsible, and what we can try to do about it. This entry was posted in Books, Miscellanious, Movies and tagged Adam McKay, Brad Pitt, Chistian Bale, Steve Carell, The Big Short, Wall Street crash. Bookmark the permalink.